Many people like to know a little about the company behind the products they buy, therefore we include a potted history of our development, philosophy, and some of our achievements. 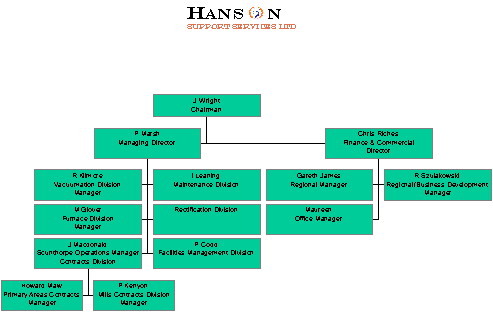 Hanson Support Services Ltd. Is a quality provider of essential, low cost industrial services. The companys low cost culture is a firm foundation on which Hanson is built. It is this background that ensures a sharp competitive edge, a philosophy which underpins the whole structure of the organisation. This coupled with a consistent contract review procedure makes sure we react to the fluid states of industry, helping our customers retain good value service. The company has been a specialist provider to the steel and chemical industries for a number of years and hence has expertise and experience in establishing and maintaining customers needs efficiently and cost effectively. 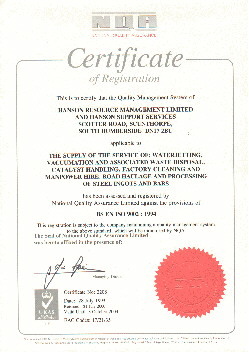 Hansons was initially established in the early 1960s as a furnace wrecker and dismantler, providing cheap unskilled labour to the Steelworks. The company has developed and moved with industries requirements, acquiring specialised cleaning equipment in its Vacuumation division, and recently specialised Plant equipment to service front side Blast Furnace operation, and Off line rectification Processing and rectification at several plants. The change of ownership in 1996 introduced significant strategic redirection for the company . The company Philosophy of competitive low cost remains, but a newer element of providing a packaged contract to service areas more efficiently, incorporating synergies obtainable from a multi skilled workforce and strategic Plant, has proved to be a new force in industrial service support operations. The company is structured into divisions to achieve efficient and good management of the disciplines. However these elements are mixed and matched to customers needs and the resulting package managed by one on site contact.